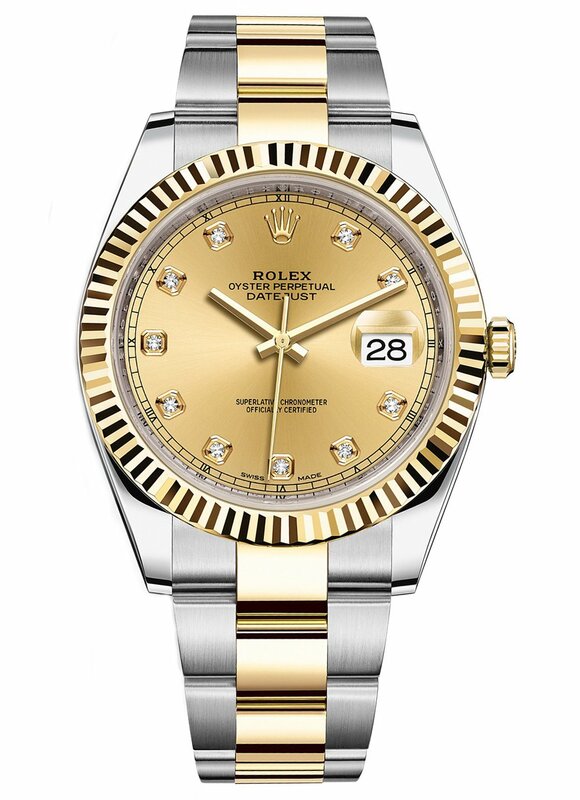 41mm Yellow Rolesor case with 904L steel, 18K yellow gold screw-down crown, 18K yellow gold fluted bezel, scratch-resistant double anti-reflective sapphire crystal, champagne dial, diamond hour markers, Rolex calibre 3235 perpetual self-winding movement, approximately 70 hours of power reserve, 904L steel and 18K yellow gold Oyster bracelet, folding Oysterclasp buckle with Easylink 5mm comfort extension link. Waterproof to 100 meters. It is a Never Worn Timepiece that also has the factory original protecting plastics at the case and springs with the Original Box and Papers. 41mm Yellow Rolesor case with 904L steel, 18K yellow gold screw-down crown, 18K yellow gold fluted bezel, scratch-resistant double anti-reflective sapphire crystal, champagne dial, diamond hour markers, Rolex calibre 3235 perpetual self-winding movement, approximately 70 hours of power reserve, 904L steel and 18K yellow gold Oyster bracelet, folding Oysterclasp buckle with Easylink 5mm comfort extension link. Water-proof to 100 meters.